Tomorrowland -- If you are a Disney fan, go see it for the novelty. Just don't expect too much. Tomorrowland — an alternate world where everyone is happy and carefree and technological advances are beyond our wildest imaginations. Of course, things are never really as perfect as they seem. 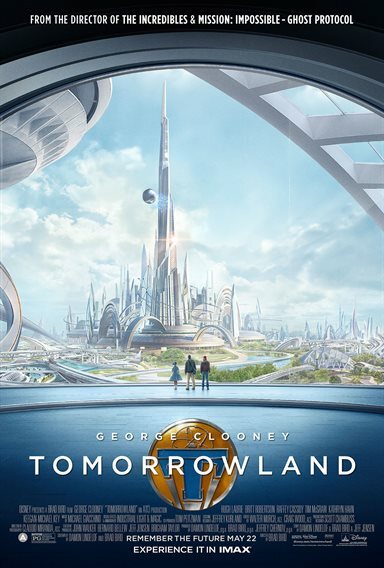 Disney's latest attempt to entwine theme parks with cinema results in an identity crisis riddled movie called Tomorrowland, out in theaters on May 22, 2015. The start of the film is somewhat confusing, as an older Frank Walker (George Clooney; Gravity, Up In The Air) tries to explain what has happened to an unknown audience while constantly being interrupted by a faceless female named Casey Newton ( Britt Robertson, The Longest Ride). Suddenly, we are in a flashback to the NY World's fair where a young Frank tries to show off his jet pack invention that doesn't actually work. However, he does catch the eye of a young girl, Athena (Raffey Cassidy; Dark Shadows), who gives him the tools to transport him to a magical world full of innovation and wonder. Years later, Casey is brought to that same world by a seemingly magical pin and seeks out the elder Frank to get some answers. The problem with Tomorrowland is that it isn't sure what kind of movie it wants to be. Some scenes are too violent for the typical young Disney audiences, while parts of the plot are too preachy and optimistic for older viewers. This creates a struggle within the film that doesn't really end up working well for anyone. There are some action scenes and electronics that will be attractive to a certain demographic but the "people have destroyed the earth" environmental message and the "Tinkerbell will live only if you believe" mentality will be a turn off to those same people. I also don't really understand why they felt the need to make the Tomorrowland costumes look like they came out of the Emerald City form The Wizard of OZ. There are a few things I enjoyed about the film and I can honestly say I didn't look at my watch once in the 2 hours, which means the film is interesting enough to keep my attention. There are little "nuggets" and inside jokes for any Disney enthusiast, including Space Mountain in Tomorrowland's silhouette and the Carousel of Innovation (today called the Carousel of Progress) theme song playing in the background of the World's fair scene. The "Hoverrail" – the Monorail of the future – is visually cool, snaking its way through the sky like a giant worm. And, you can certainly bet the newest trading pin at the theme parks will be the big T featured in the film. Most notable however, is the acting. Clooney, Robertson, and Cassidy are excellent and it is wonderful to watch the younger actors work well side by side with the veteran Clooney. Tim McGraw (The Blind Side) does a good job as Casey's Father and Hugh Laurie (House) is great as Governor Nix, the antagonist who is content to sit back and watch the Earth destroy itself. Unfortunately, Tomorrowland doesn't have a clear cut evil purpose and it is never quite explained why the "robots" come to earth to try and kill Athena and Casey. Nor is it revealed why Tomorrowland isn't prospering and has fallen into a world of cracked sidewalks and crumbling infrastructure. Download Tomorrowland from the iTunes Store in Digial HD. For more information about Tomorrowland visit the FlickDirect Movie Database.